Lion Sands Reserve was established in 1933 by Guy Aubrey Chalkley. 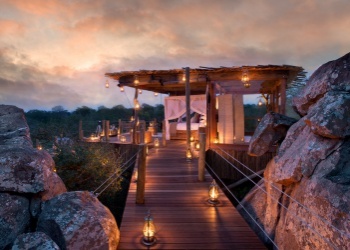 The reserve forms part of the Sabi Sands Private Game Reserve, situated on the western border of the Kruger National Park, which together with some other parks make up the Greater Kruger National Park in northeastern South Africa. The reserve has the big five game animals(lion, African elephant, Cape buffalo, leopard, and rhinoceros). Accommodations include the Ivory Lodge, ultra luxurious, award winning River Lodge, built on the banks of the Sabie River, and the 1933 Lodge plus 3 treehouses. The African landscape stretches as far as the eye can see at Lion Sands, and we knew we had to find a special place to capture and enjoy its vastness and splendour. Guy Aubrey Chalkley once set up camp in a majestic centuries-old Leadwood Tree to escape predators roaming the plains below. 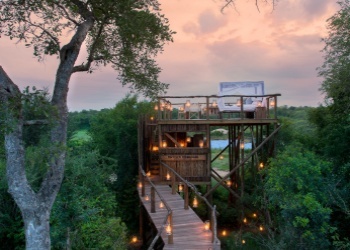 We decided that this would be the ideal place to build the ultimate bush bedroom, the Chalkley Treehouse. The tree house is a secure and lavish platform under the African stars, with all the comforts that a guest can experience at a five star safari lodge. We take our guests to the tree house at sunset, where drinks and a scrumptious picnic dinner await them. The hours of African dusk can be enjoyed relaxing and absorbing the vastness of the bushveld as it transforms from day to night, before turning in for slumber beneath the incredible night sky. The Kingston Treehouse is constructed entirely from wood and glass, with contemporary d�cor in understated hues of greys, white, black and purple. No matter what the weather has in store, you will have a safe and luxurious setting with a unique window to enjoy the ever-changing views. In fact, we defy you to find two identical African sunsets. This treehouse is situated about 5 minutes from the main lodge, and you will have radio contact with the rangers, should you choose to. You will also find some cellphone reception; but don�t expect any wi-fi in the bush. Kingston is equipped with full bathroom and shower facilities, and Africology products to complete your sensory experience. Let the Sabie River itsel welcome you to this endless African landscape. 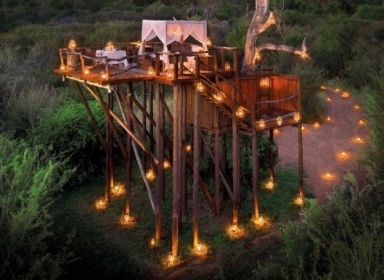 The Tinyeleti Treehouse, which translates to Many Stars, is not merely a vantage point from where to observe the splendor that is The Sabie River and all the life it sustains, but rather an open-air invitation to take your place and become part of it. 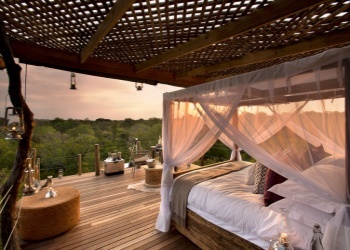 Tinyeleti Treehouse is fully equipped for your relaxation and you can expect all the comforts of a luxury stay � such as the option of a relaxing head massage. Enjoy your choice of tapas or a full meal, and then settle in with a cocktail as the animals come to drink at sunset. The deck can accommodate 4 people, and children are welcome. We will provide you with a torch, and, even though there is no electricity, you will find a few bars of cellphone signal. Expect to hear the constant rush of life from the Sabie River on your doorstep, as well as a few animals, night predators and birds chiming in. Tinyeleti is an uninterrupted overnight experience that cannot be replicated, but that will most definitely be re-told. That is, if you can find the words to describe it. For us who have come here many times over, well, we're still at a loss.